Heat water in a deep pan on medium heat. Add garlic & bring to a boil. Add carrot, red bell pepper, spring onion, Thai chilli. Cook for 8-10 minutes or till all the vegetables are almost done. Add broccoli, chinese cabbage, salt, vinegar, soy sauce, black pepper. Mix well & cook for 2 minutes. You can use any veggies of your choice for the soup (mushrooms, celery, cauliflower, green peas etc). 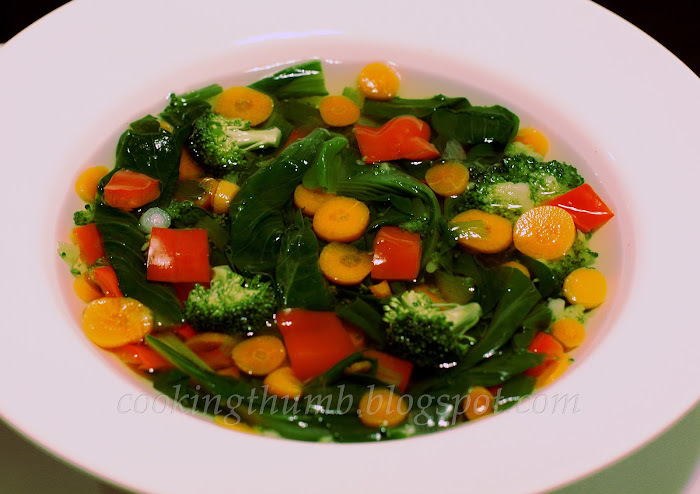 beautiful soup, the clear broth with the vibrant colours of the veggies looks stunning! Thanks Alanna! It does look very appealing :) Also, tastes awesome & so very healthy too.